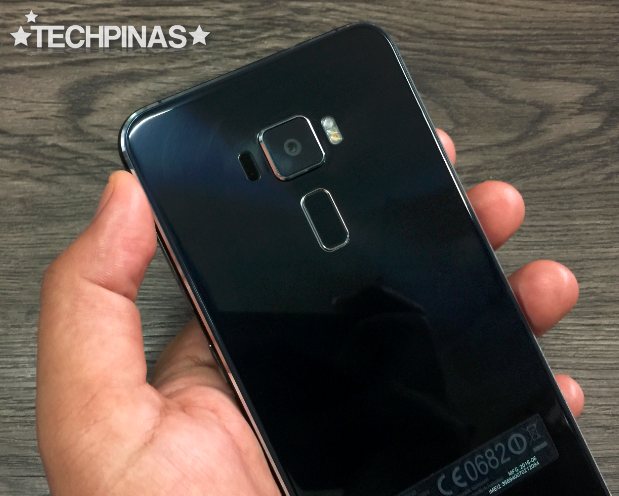 On August 14, 2016 at #Zenvolution, Asus Philippines will be officially launching its new batch of ZenFone models, covering various price echelons and each offering unique selling points that match the desires and needs of Pinoy mobile consumers. 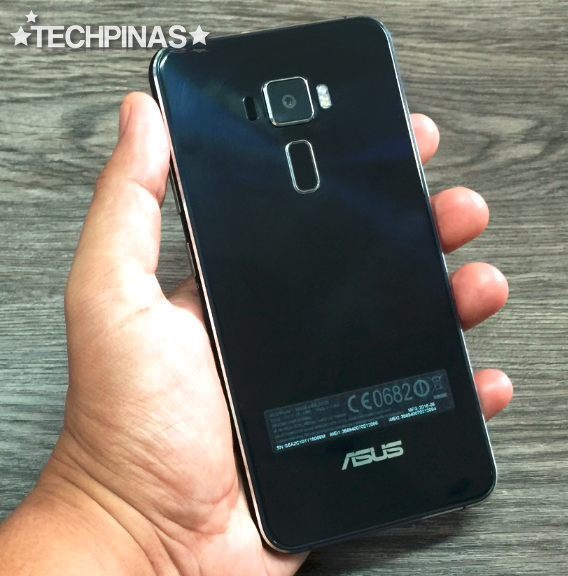 The specific devices that the Taiwanese company is expected to formally introduce at the event are the Asus ZenFone 3 Deluxe, ZenFone 3 Ultra, ZenFone 3 Laser, ZenFone 3 Max, ZenFone 3 5.2-inch, and ZenFone 3 5.5-inch; The last two having multiple versions with varying amounts of RAM and internal storage. 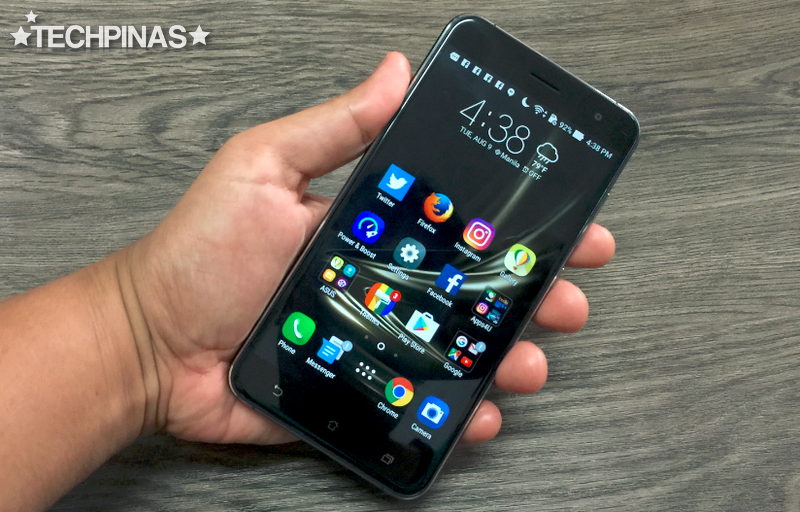 In this post, I will be unboxing the much-awaited and already quite popular 5.5-inch Asus ZenFone 3 ZE552KL with 4GB of RAM and 64GB of ROM. 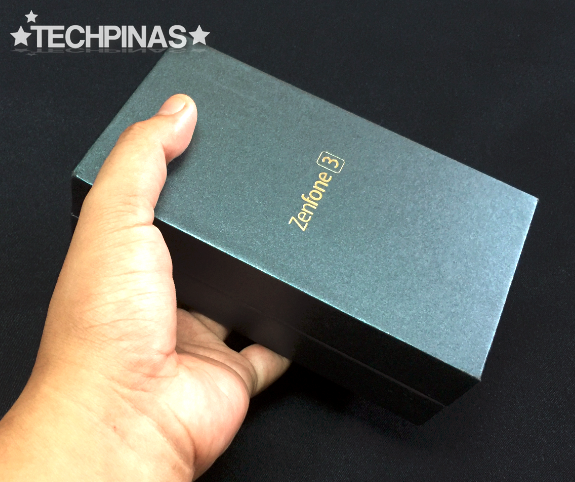 Complementing the premium design and build of the device that it houses, ZF3's shiny packaging looks and feels much more high-end compared to that of ZenFone 2. 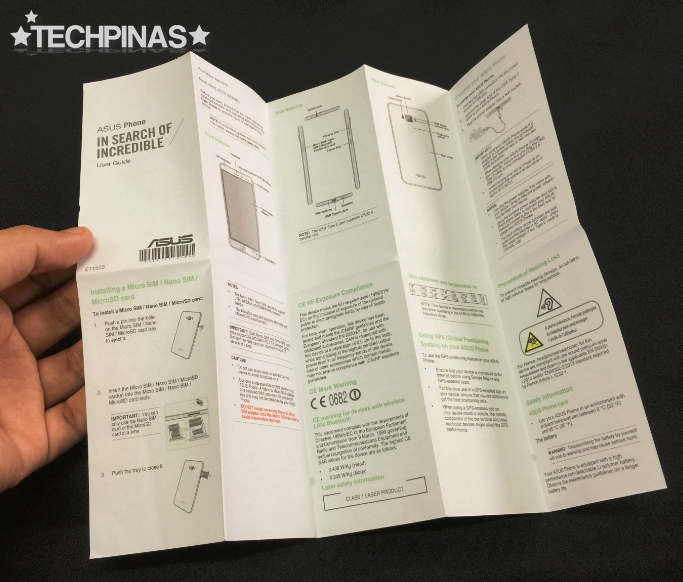 Details about the smartphone are listed on stickers placed at the bottom of the box. I like how Asus tried to keep the carbon footprint of the case relatively small. The whole box is also made form 100% recyclable material. 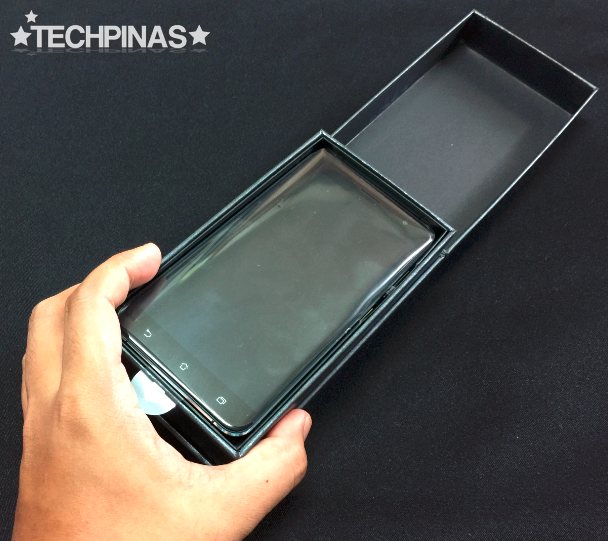 Lifting the cover, we are greeted by the handset itself with transparent plastic cover. 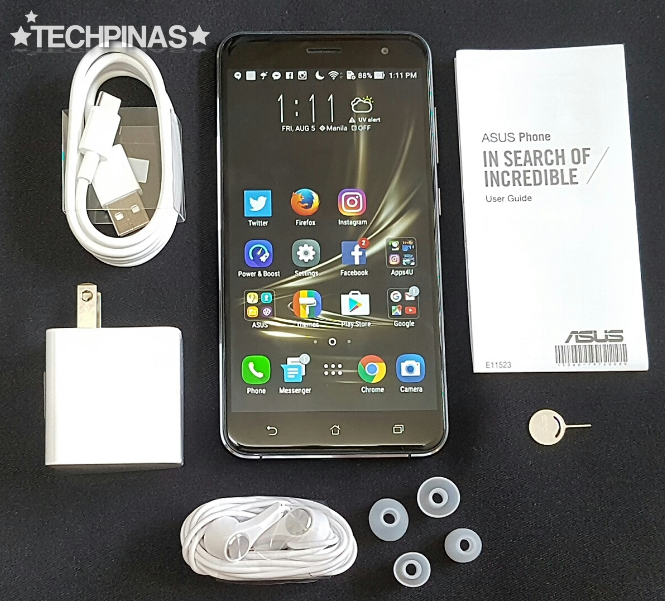 This is the complete retail Asus ZenFone 3 ZE552KL package. 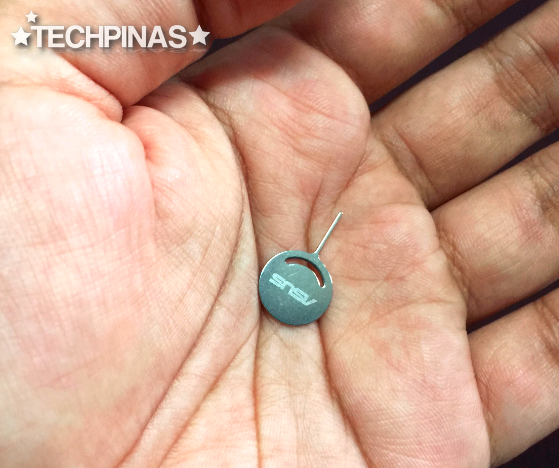 You'll also get a similar set if you instead purchase the smaller Asus ZenFone 3 ZE520KL. Let's take a close look at the items. 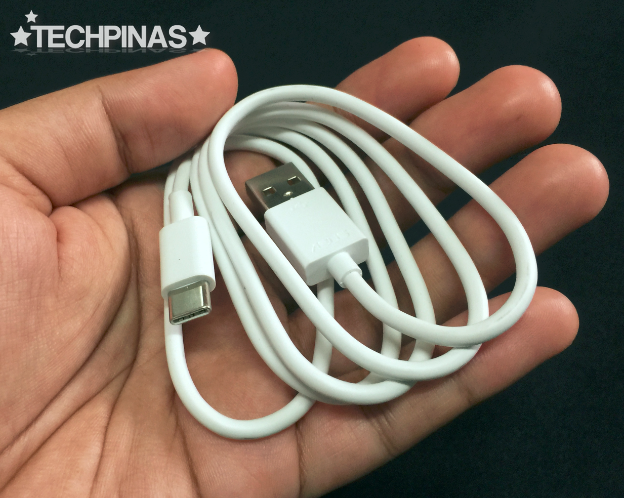 The travel charger has 2.0A output. Design-wise, the included earphones have metallic accents with brushed concentric pattern. 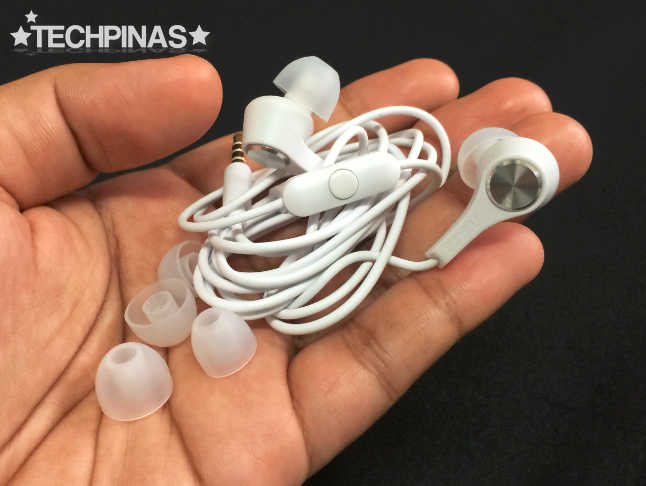 It also has microphone for making calls and voice recording as well as in-ear silicone buds in three sizes. I think the SIM tray ejector tool looks really cute. 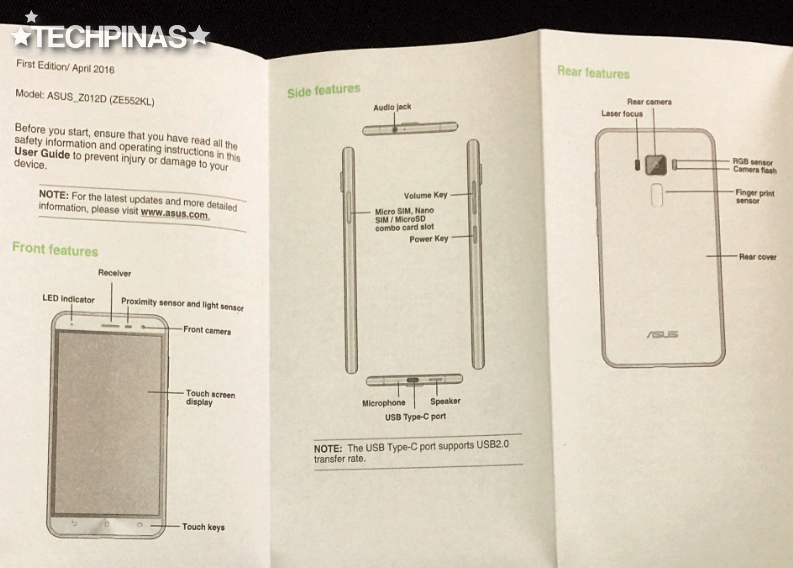 If you have time, read the neatly folded user manual. I particularly like this diagram showing the different parts of the handsets. 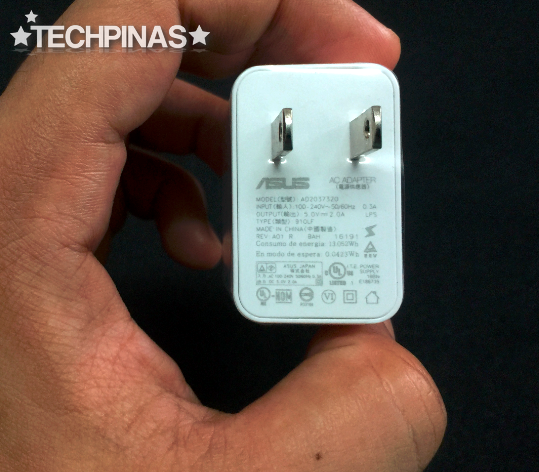 Asus ZenFone 3 sports a USB Type C port, which doesn't only let you plug this cable to it without worrying if you have the right side up but also allows for faster data transfer or syncing. Alright! 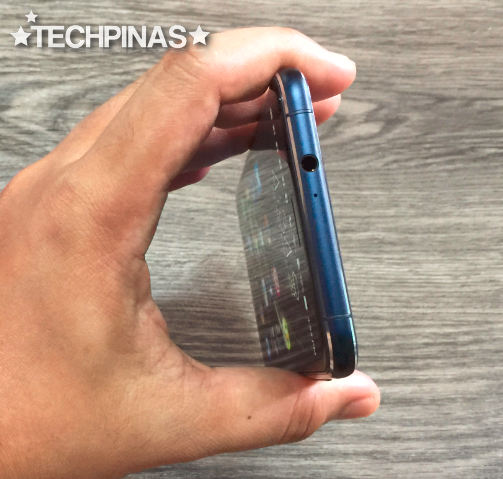 Now, let's take a look at the amazing handset itself. 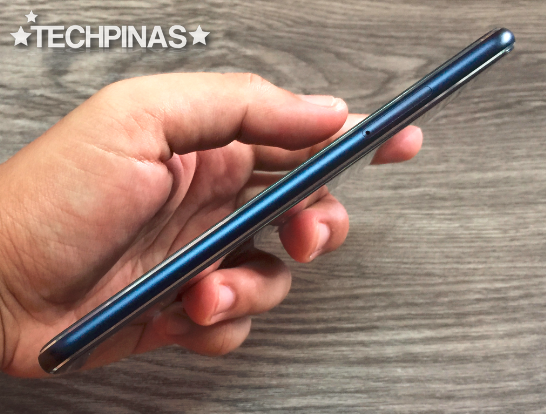 This particular model sports large 5.5-inch Full HD IPS panel, putting it well within the phablet category. The display is clear, crisp, and brilliant as one would expect from an IPS screen having such size and resolution. 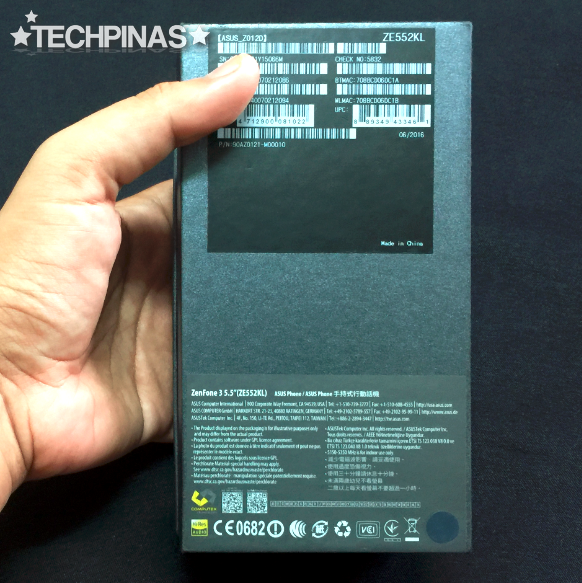 As you can see in these images, Asus ZenFone 3 ZE552KL represents a tremendous design and construction upgrade coming from Asus ZenFone 2 ZE551ML from 2015. Whereas last year's flagship had a shell made predominantly of plastic, the 2016 iteration to the line flaunts a downright gorgeous exterior made of two scratch-resistant glass panels sandwiching a real metal mid-frame. 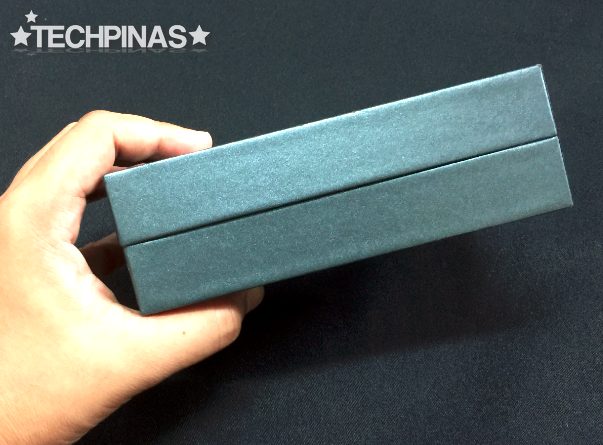 The frame is crafted from anodized aluminum and has shiny chamfered edges. It is also slightly curved, which perfectly complements the look and feel of the 2.5D Curved Gorilla Glass 4 front and back panels. At the back, you'll find the Fingerprint Scanner - one of the new security features of ZF3 that allows you to unlock it with but a touch of a finger - and the 16 MegaPixel autofocus camera with Dual Tone LED flash and a more powerful Sony IMX 298 - representing a considerable leap from the rear camera of ZF2. I kind of wish though that the camera module were less protruding because as it is, that part becomes a hapless impact point when you place the handset on a rough surface. 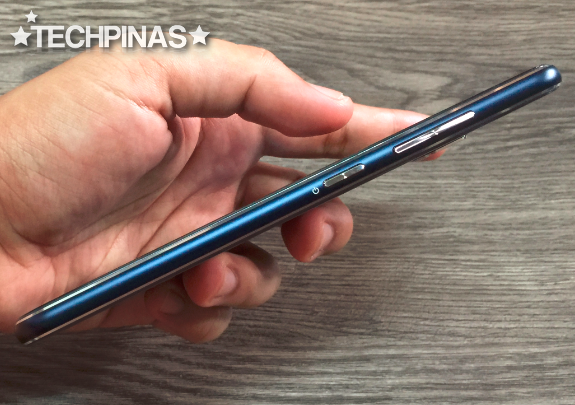 The rear cam is matched by the 5 MegaPixel front-facing selfie shooter, which still benefits from Asus' industry leading Beautification Mode giving users great looking self-portraits that are instantly ready for sharing on Facebook or Instagram. 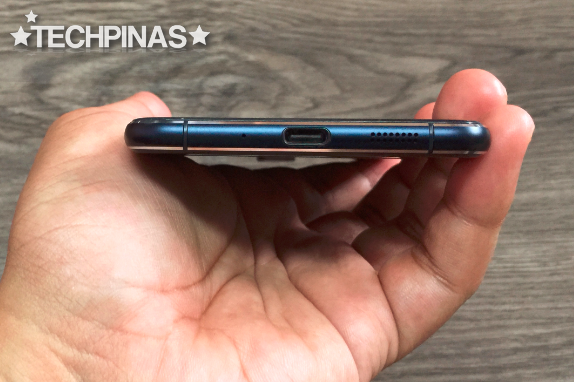 The real metal power button and volume rocker are both located on the right panel, making them easier to press using the thumb when you hold the phablet with your right hand or using your index finger when you hold it with your left. Flanking the USB Type C port at the rear are the microphone on the left and the top-notch loud speaker on the right. Let's discuss what the handset has at its heart. 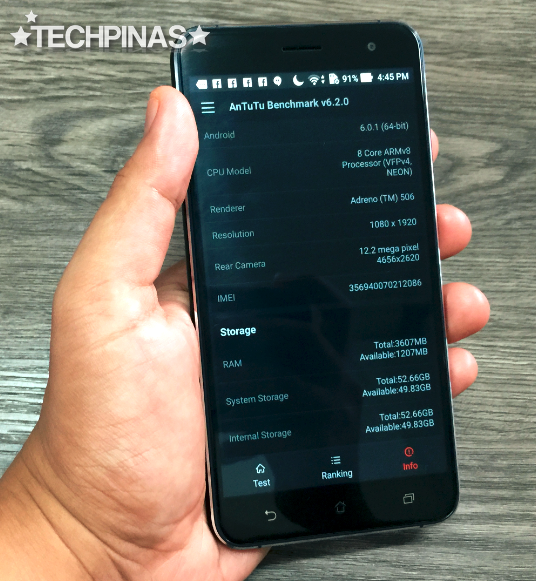 The Asus ZenFone 3 5.5-inch model that I have here runs its Zen-UI-flavored Android 6.0 Marshmallow OS with a 64-Bit Octa Core 2.0 GHz ARM Cortex A53 and Adreno 506 GPU based Qualcomm Snapdragon 625 MSM8953 chipset, has 4GB of RAM, and comes with 64GB of internal storage. 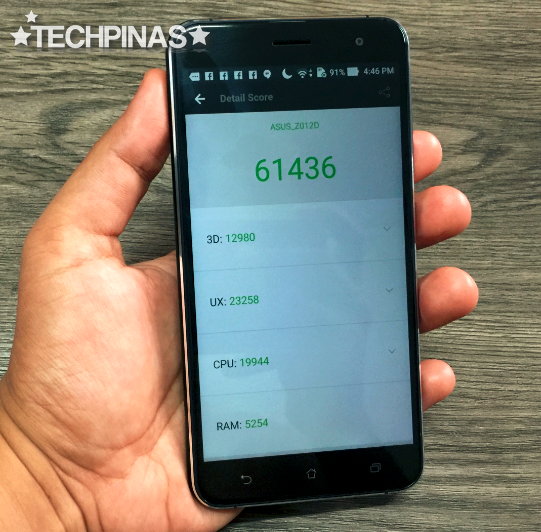 Together, these internal hardware combine to give the Asus ZenFone 3 ZE552KL an Antutu Benchmark Score in the rangle of 61,000 to 63,000. Here, I got 61,436. Having used the handset for more than a week now, I'd have to say that when it comes to response time, screen transitions, and multitasking, the ZF3 is one of the best handsets of 2016. 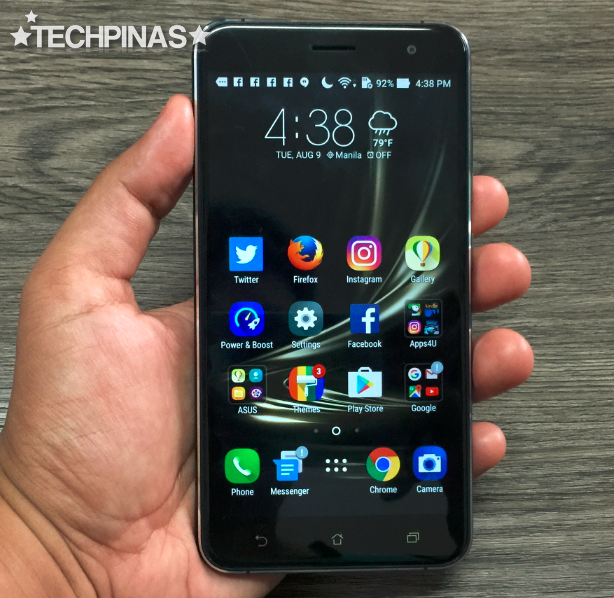 It delivers a pretty decent performance when running specs-intensive 3D games but if you want a 2016 device that will give you the absolute best, buttery smooth gaming experience, I would suggest that you check out the more expensive and powerful Asus ZenFone 3 Deluxe. Alright! That's it for now, TP Friends. I will be updating this entry regularly as I experience more cool features of this stellar new release. On August 1p 4, 2016, Asus will finally disclose the official suggested retail price of this model and I look forward to hearing that as well. Stay tuned for updates. 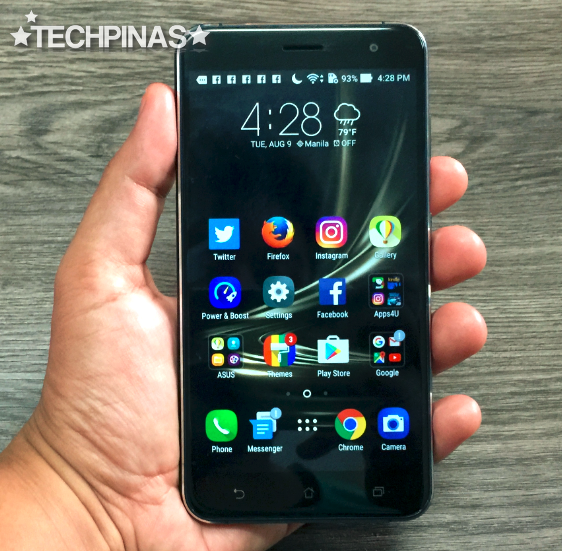 Update as of August 14, 2016: The official SRP of this particular model is Php 18,995.